Background: Conveying information to patients on how to use medications at the dispensing sessions and retention of this information by the patients is essential to the good pharmaceutical care. The aim of our study was to examine the comprehensibility of the selected three potentially usable pictograms by five groups of subjects who had different levels of literacy in both before and after mini educational sessions. Materials and Methods: Nine experienced pharmacists selected three potentially usable pictograms in Isfahan pharmacies: Pictograms D through F representing respectively: “do not take medication during pregnancy,” “keep medication in the refrigerator,” and “take medication with plenty of water.” Then, graduate students of two major universities (Groups 1 and 2), low-literate and illiterate individuals (Groups 3 and 4), and walk – in patients in the pharmacies affiliated to the Isfahan School of Pharmacy (Group 5) were asked about the comprehensibility of these pictograms before and after mini-education sessions. The American National Standard Institute and International Organization for Standardization standards were used for comparisons. Results: In the pre-follow-up period, D and E pictograms were most understandable (87.4%, 87.2%). In the post-follow-up, E and D pictograms were understood most (98.0%, 95.3%), followed by F (92.9%). Among the improvements measured in post-follow-up, pictogram F showed the biggest improvement (P = 0.0). 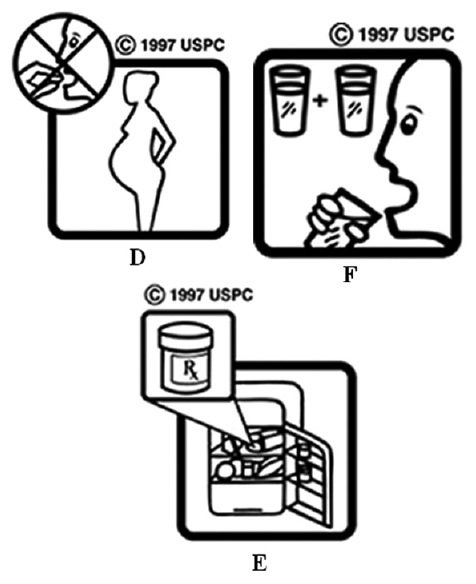 Conclusion: Pictograms depicting the use of medications during pregnancy (D) and storing medication in the refrigerator (E) was easier to understand by our study population. The groups with the high level of literacy interpreted the pictograms better than those with lower levels of literacy. Background: Stroke as a devastating condition is a major cause of death worldwide. It is accountable for long-term disability with high personal and social cost in adults. Alpha-lipoic acid (ALA) is an eight-carbon, sulfur-containing compound with antioxidant properties which reduces body weight, changes other anthropometric indices, and regulates food intake by suppressing appetite and increasing metabolism This study was designed to evaluate the possible effects of ALA supplementation on anthropometric indices and dietary intake in patients with stroke. 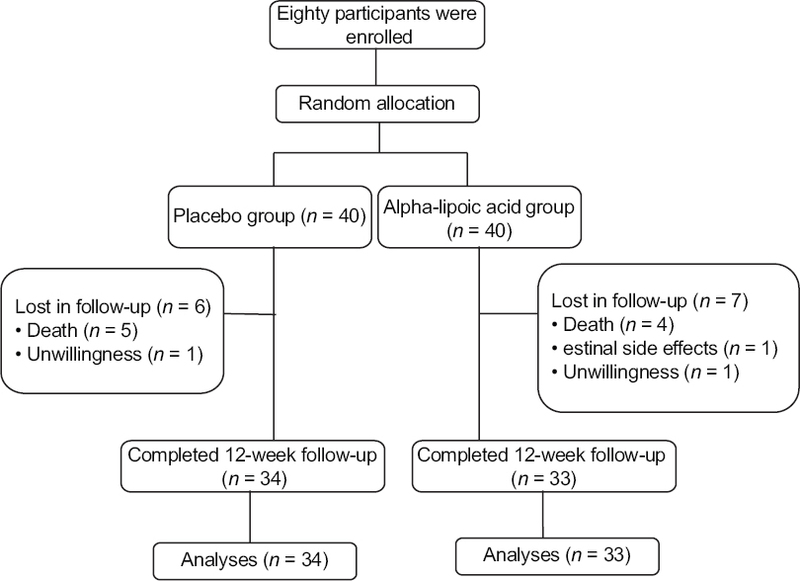 Materials and Methods: In this randomized, double-blind, placebo-controlled clinical trial, 67 patients with stroke were randomly allocated to two groups (taking a 600 mg ALA supplement or placebo daily for 12 weeks). Weight, waist circumference, energy, carbohydrate, protein, and fat intake were measured, and body mass index (BMI) was calculated before and after intervention. Dietary intake and statistical analyses were carried out using Nutritionist IV and SPSS (version 16; SPSS Inc., Chicago, IL, USA) software, respectively. 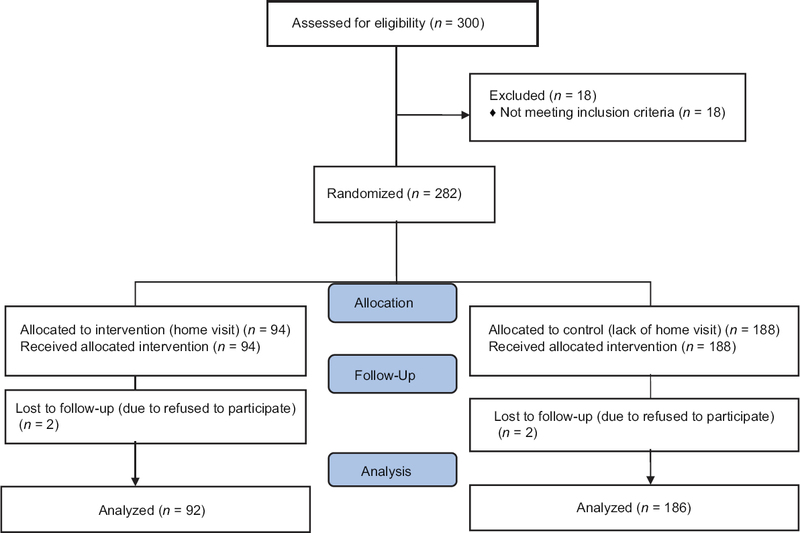 Results: Primary features were similar in the intervention and placebo groups (P > 0.05). Waist circumference (P < 0.001), energy, carbohydrate, protein, and fat intake (P < 0.001) decreased significantly, after the intervention period, in ALA group compared with placebo. While no significant change was observed in weight (P = 0.26) and BMI (P = 0.56) in ALA supplementation group compared with placebo. Conclusion: Results of this trial indicated that 12-week supplementation with 600 mg ALA can decrease waist circumference and food intake (energy, carbohydrate, protein, and fat) in patients with stroke. Background: Postpartum home care plays an important role in prevention of postpartum complications. Regular visits of mothers during this period are imperative. This study aimed to provide postpartum home care for mothers to assess its effects on mothers' health in Iran. Materials and Methods: This study was carried out in two phases. First, a comprehensive postpartum home care program was compiled by performing a comparative study, using the available guidelines in this regard in different countries and based on the opinions of the experts. Next, a clinical trial was carried out on 276 women who gave birth in the university hospitals affiliated to Shahid Beheshti University of Medical Sciences. There were 92 mothers in the intervention and 184 in the control group. The intervention group mothers were provided with postpartum home care service while the control group did not receive such a service. Results: Outcome assessment at 60 days' postpartum revealed a significant difference between the two groups in terms of the use of supplements, birth control methods, postpartum depression, breastfeeding problems, constipation, and fatigue (P < 0.05). No significant differences were noted between the two groups with regard to hospitalization, hemorrhoids, backache and lumbar pain (P > 0.05). Conclusion: The postpartum home care program had a positive effect on some aspects of the mothers' health status and their satisfaction in our society. Background: Diagnosis of infection in diabetic foot ulcer (DFU) is not always simple. The analytic precision of procalcitonin (PCT) was evaluated to clarify the use of PCT for distinguish the presence of infection in DFU in comparison to other inflammatory markers. Materials and Methods: This study comprised 88 subjects distributed into four groups: 16 nondiabetic healthy subjects (group control), 17 patients with type 2 diabetes mellitus without foot Complication (group DM), 25 patients with noninfected diabetic foot (group NIDF), and 30 patients with infected diabetic foot (group IDF). Fasting blood samples were taken for measurement of glucose, hemoglobin A1C, lipid profile, renal function, erythrocyte sedimentation rate (ESR), and white blood cell (WBC) and its derivatives. 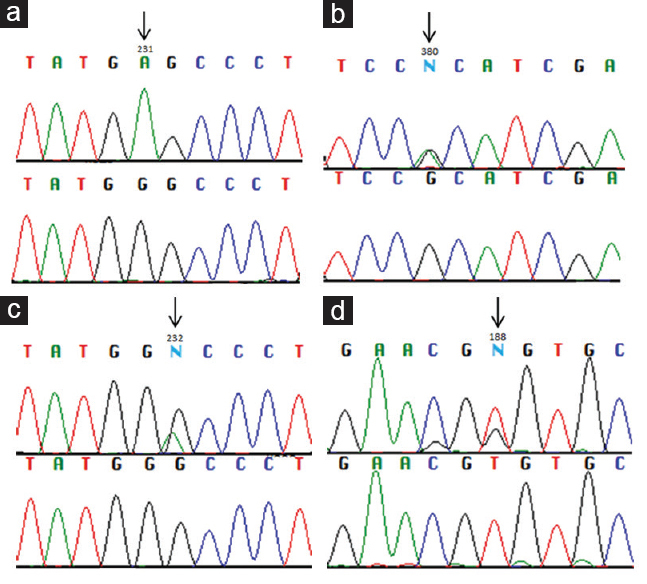 Plasma PCT was determined using an enzyme-linked immunosorbent assay. Results: PCT, WBC, ESR, and neutrophils (NEU) were found significantly higher in IDF group than other groups. 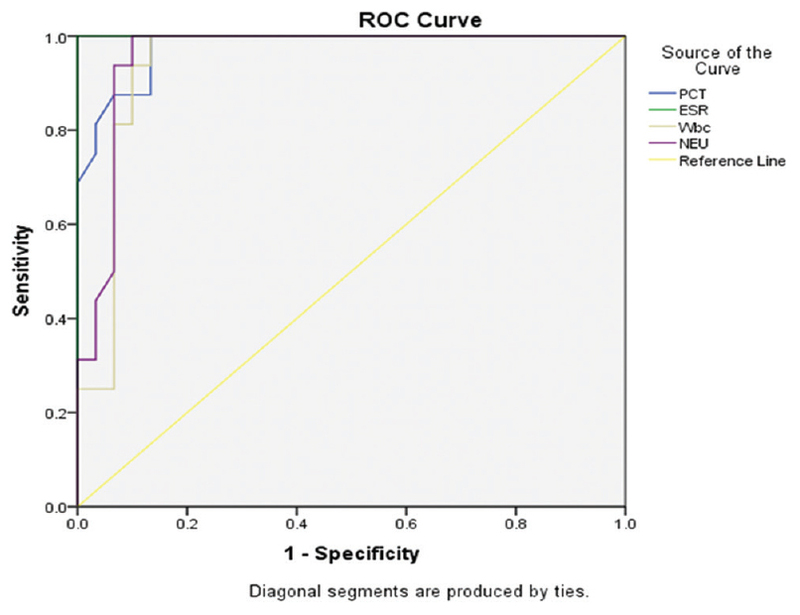 The receiver operating characteristic analysis showed that sensitivity, specificity, the best cutoff value, and the area under the curve were for ESR (100%, 93%, 31.5 mm/h, 1; P < 0.001), for PCT (87.5%, 86.7%, 66.55 pg/dl, 0.977; P < 0.001), for NEU (93.8%, 93.3%, 5.35, 0.957; P < 0.001) and for WBC (93.8%, 90%, 9.29 × 109/L, 0.942; P < 0.001), respectively. Conclusion: The outcomes of this study recommend that PCT can be an asymptomatic marker in the diagnosis of infection in DFU with higher Wagner grades in combination with different inflammatory markers.